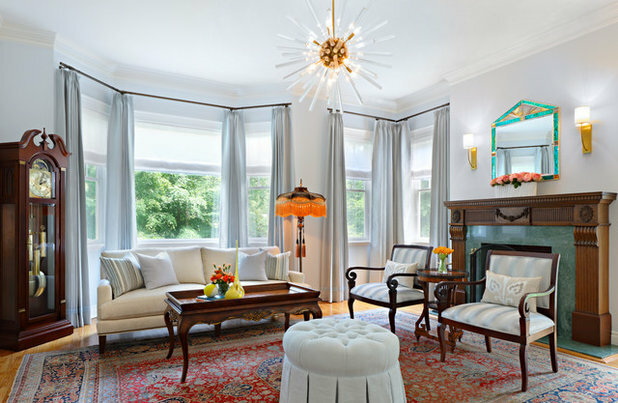 Width of room (in feet) + length of room (in feet) = diameter/width of chandelier (in inches). So, for example, if your room is 14 feet long by 10 feet wide, a 24-inch diameter chandelier would look proportionate (14 feet + 10 feet = 24 feet, which you convert to inches). This is a common rule that helps you keep the scale of your chandelier in proportion to the size of the room. To me, this rule is best used as a starting place and not as a hard and fast rule, but it definitely helps set a minimum size. 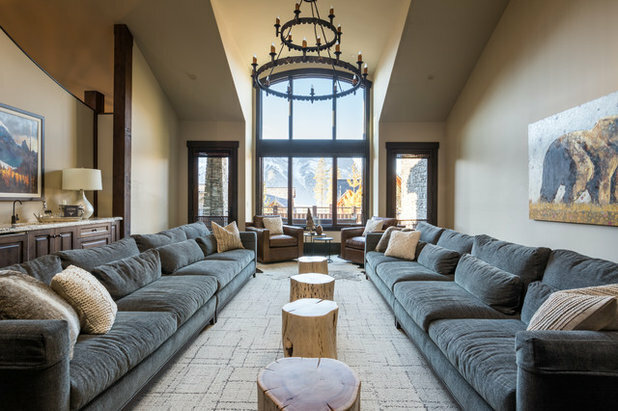 If your light will be centered on a seating area and not the entire room, use the approximate length and width dimensions of that area instead of the entire space. Another way to calculate this is to add the length the light will be from the two closest walls and then double it to get your approximate chandelier diameter in inches. For example, if the center of your seating area is 7 feet from one wall and 8 feet from the other, then 7 feet + 8 feet = 15 feet; 15 feet x 2 = 30 feet, which you convert to inches. So a 30-inch-diameter fixture would be a good fit. Now that you have the width and diameter of the fixture, you’ll want to choose the vertical dimensions of the fixture (not the height above the ground just yet, but the actual top-to-bottom size of the unit itself). To choose the vertical dimension of a chandelier, the classic rule is to take the room height (in feet) and multiple it by 2.5 to 3 to get a good range (in inches) for the vertical proportions of the light. For a 10-foot ceiling, 25 to 30 inches will be a better proportional fit. (10 feet x 2.5 = 25 feet; 10 feet x 3 = 30 feet. Convert to inches to get a range of 25 to 30 inches). And the taller the room, the more you can err on the high side of that formula. As for the height you hang the chandelier above the floor, you’ll want to go at least 6 feet 6 inches so that nobody is likely to bump their head. A standard of 7 feet above the floor works for most spaces with a ceiling higher than 8 feet. If you do the math, however, with a standard 8-foot ceiling, you cannot fit a 20- to 24-inch light at this height to follow the previous rule. 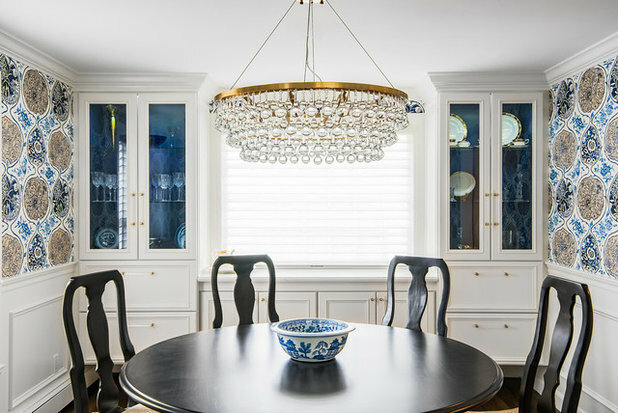 For this reason, and because so many modern chandeliers do not use the same sorts of shapes as traditional chandeliers, I would say you can safely throw the 2.5- to 3-times height rule out and focus primarily on the width if your situation demands it. For spaces with very tall ceilings, hang the light at 8 feet above the floor (plus an additional foot if the room is taller than 12 feet). You can also look to lights that hang in tiers to fill the height well while also landing low enough to help make the space below feel more intimate. In an entryway with a more normal-height ceiling, keep in mind that a light fixture will have to avoid the door swing. 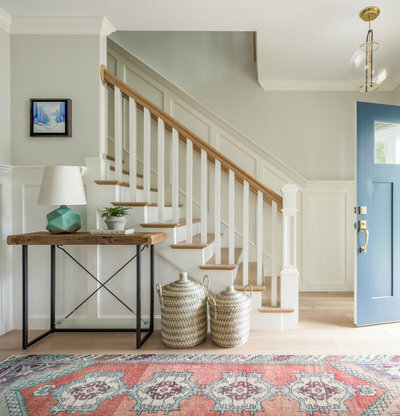 Centering a light on the entry vestibule can be beautiful, but you may want to choose a petite pendant or a flush-mount instead of a true chandelier to avoid any collisions. 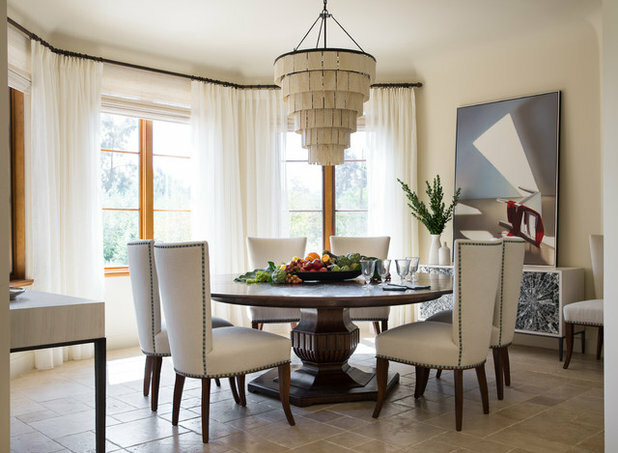 A chandelier over a dining table has some special considerations. First, it should be low enough to create an intimate atmosphere but still not in anyone’s way. Hanging it with the bottom 30 to 34 inches above the table is a good rule. And make sure it doesn’t extend wider than the table — at least not any portions that are low enough for someone to bump their head. Lengthwise, a chandelier will ideally be one-half to two-thirds of the length of your table to create a nice balance of proportions. 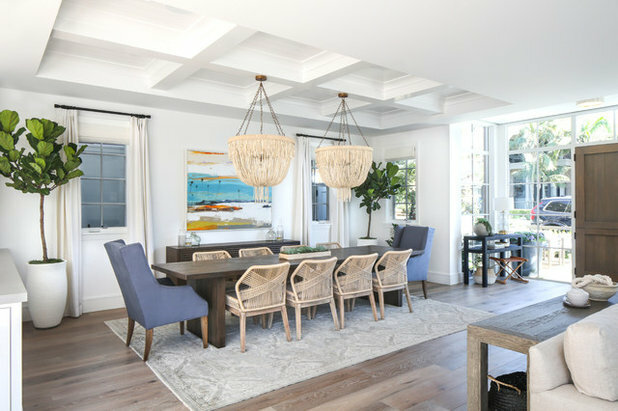 If you’re using a modern style of chandelier in a thin linear or branching shape, choose one two-thirds to four-fifths the length of the table so it doesn’t look too small to hold its own. 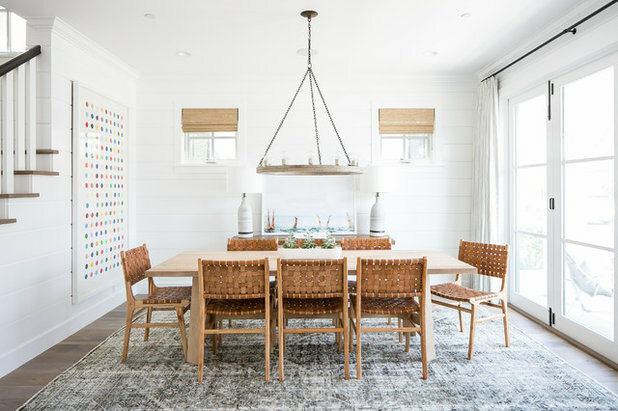 For a round dining table, choose a round or square fixture one-half to two-thirds the width of the table all the way around. 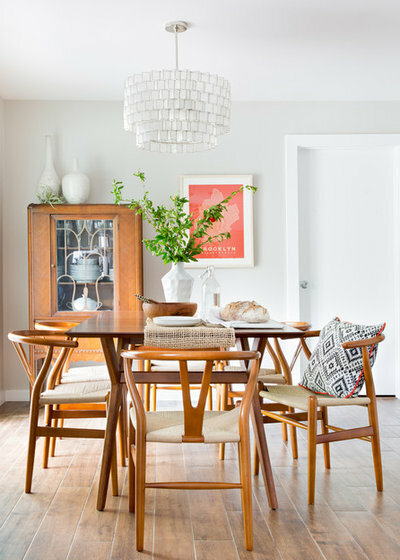 If the light is too wide it will likely make the table look small and awkward, and if it’s rectangular the pieces will likely look disconnected. 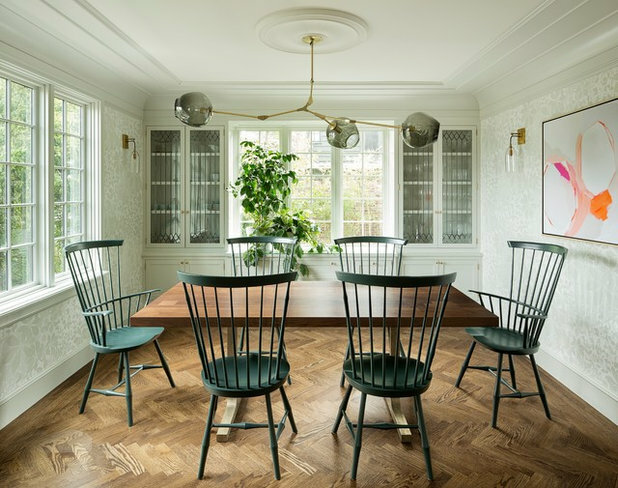 For a small round table (say, a 48-inch table in a breakfast nook) a light can be more on the petite side without looking off, so feel free to choose something smaller and keep the look a little lighter if you prefer. 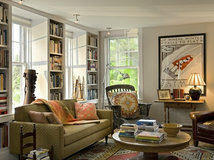 Keep in mind when sizing a light that size isn’t the only issue; you should also consider the other decor in the room. 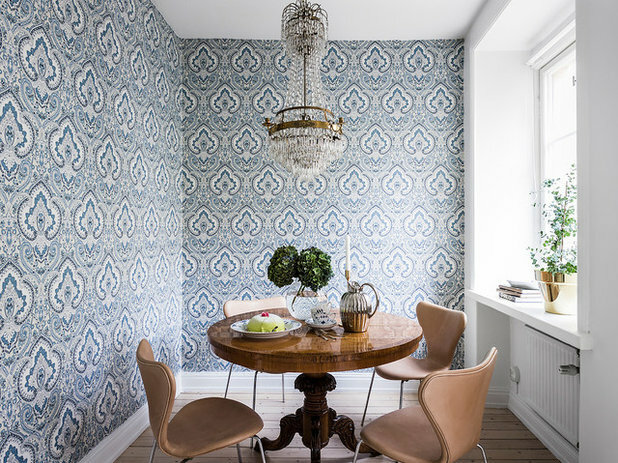 For a room with rich wallpaper or other busy patterns, a chandelier with intricate detailing will look appropriate. 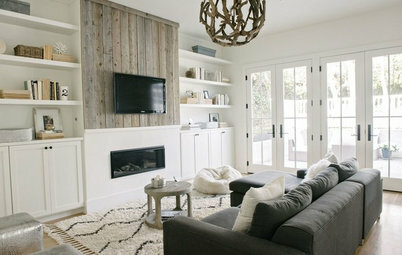 In a more subdued space with lots of white walls or neutrals, a simpler, smaller light fixture will be more fitting. 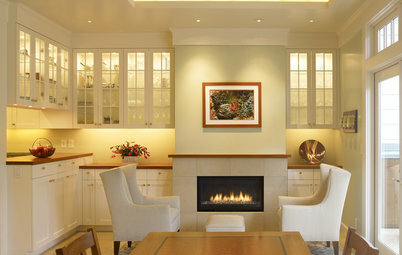 The rules and tips I’ve listed up to this point are great for choosing a fixture that follows classic proportions. 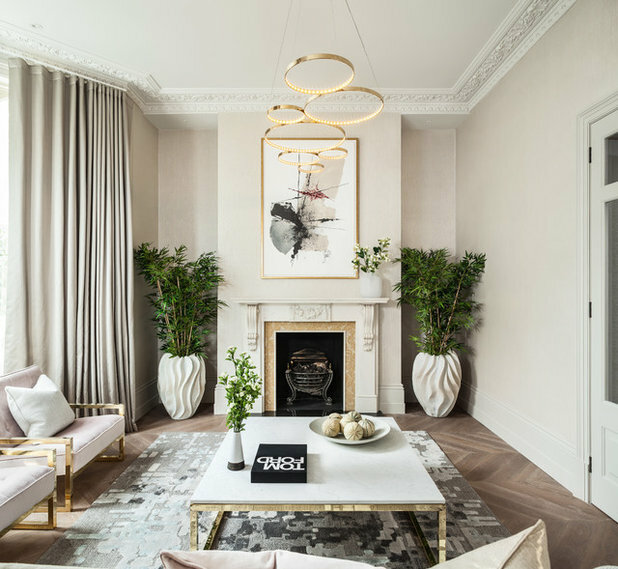 However, a recent lighting trend has been to buck these classic proportions and choose oversize fixtures instead to make a calculated statement through the sheer drama of large scale. 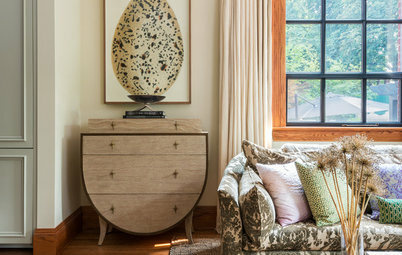 Of course, the scale of a light must still make sense for the space it is in, but throwing caution to the wind and choosing a somewhat larger fixture instead of playing it safe can lead to eye-catching results. 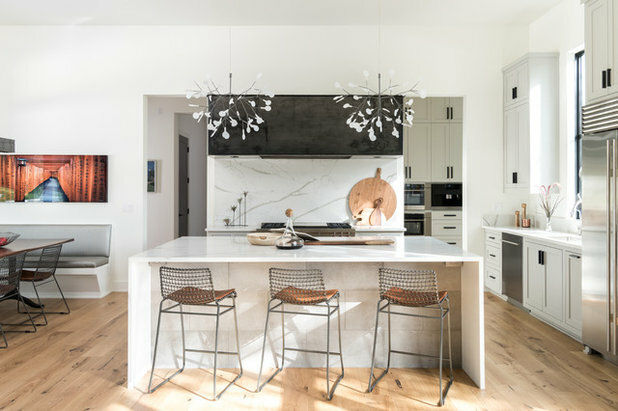 This is especially true for simple modern fixtures in minimalist silhouettes, such as a light like this that blurs the line between a chandelier and a large pendant. 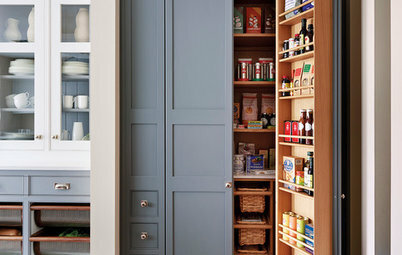 The fact that this one is almost as wide as the table, and rather deep, gives a lot of impact in this compact eat-in kitchen. Taking a different approach from overscale lights, another huge trend we’re seeing is airy lighting that may technically be large in diameter but includes a great deal of negative space for a breezy, open vibe. Sometimes the best way to make people listen is to whisper, and sometimes the best way to make a visual statement is by using a fixture that is so minimal or airy that you can’t help but notice. Lighting like this is made all the more accessible by the continuing evolution of LED technology, which allows for continuous curves and other streamlined silhouettes that could never be re-created by a traditional bulb. Lights in this trend are almost more empty space than actual light, which allows them to be installed in a large size without appearing heavy or interrupting a room. 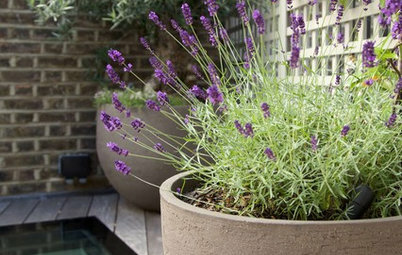 This is especially important in breezy spaces with lots of bright white and windows, creating a peaceful atmosphere. 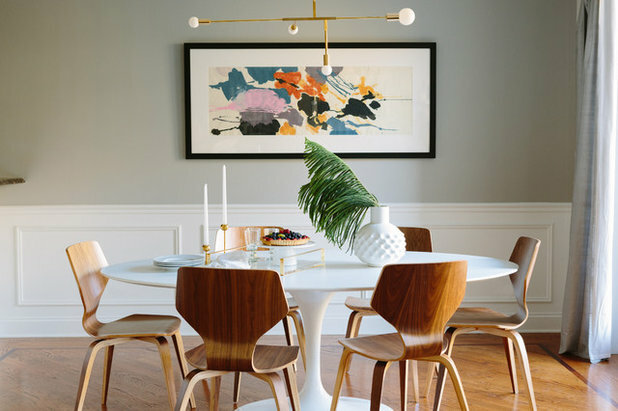 While warm-toned metallics continue to be a huge trend, what we’re seeing work best in many homes is a softer form of gold that isn’t so “blingy” and is a bit more demure. “Softer” can mean various things, from an antiqued finish to a subtle brass tone that isn’t as boldly yellow as true gold. Either way, the hue of the metal is kept subtle so as not to appear gaudy or flashy, opting for a more timeless sophistication. Also popular are fixtures with thin elements of golden metallics, so the material is present but not overwhelming. 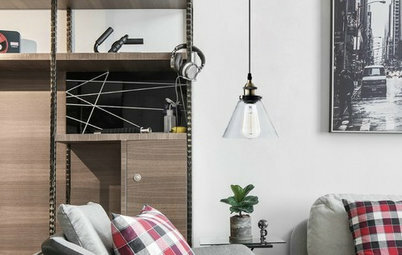 This works especially well in spaces that pick up a similar metal tone elsewhere, such as in small accessories, frames or even fun, trendy golden cutlery. You can use a basic light fixture to illuminate an artistic element in your home, or you can let a light fixture be the piece of art. 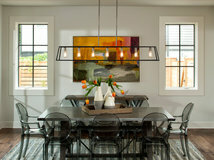 Light fixtures that appear like a sculptural installation are trendy right now but also timeless, like any great art. 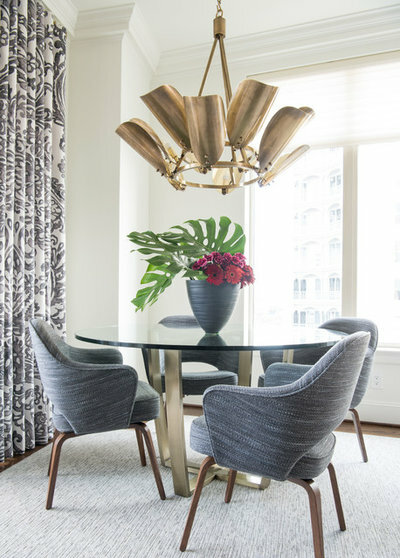 Lights that draw inspiration from natural forms like oversize leaves are especially popular because they carry associations with classical architecture and exotic destinations, bringing a worldly appeal to the room. An engaging sculptural shape can be a great way to add some extra oomph to a fixture without upping the scale, which is good in tighter rooms where a very large fixture would be impractical (such as under a low ceiling, in a tighter powder room). 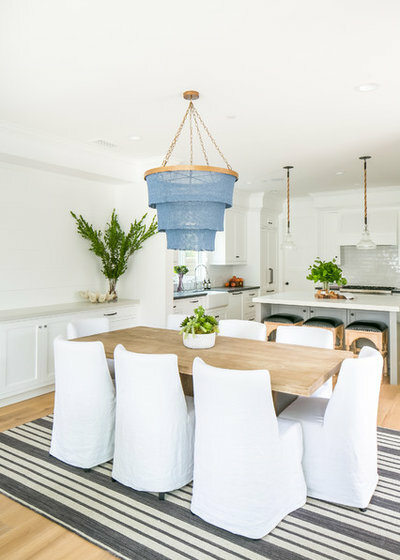 When you imagine a light fixture, your first thought might be something made of glass and metal, or with a typical fabric shade. However, lights and shades can be made out of many materials, so consider using a light fixture as an opportunity to add a new and inviting texture to a room. 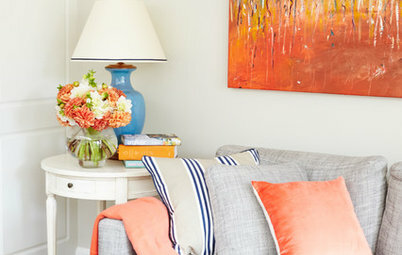 Besides bringing texture to a space, a great light fixture can also bring a dose of color. And they don’t have to be limited entirely to neutral hues. 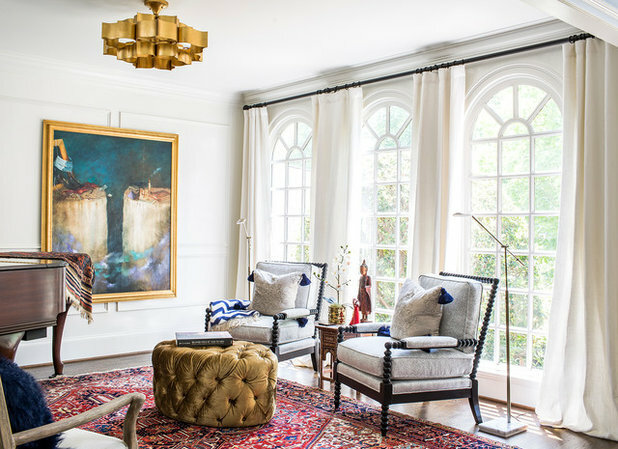 Like a rug, a great colorful chandelier can bring an accent hue into the center of a room in an unexpected way that shows a lot of personality. 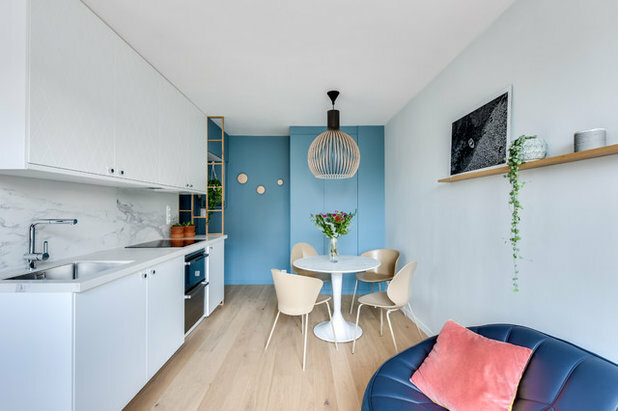 Keep in mind that a light fixture isn’t as easy to switch out as an accent paint color on the walls, so choosing a safe-bet hue like a dreamy blue is a good long-term choice. 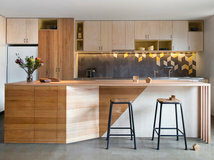 Mixing old with new is far from a new idea, but it grows stronger as a trend every day. 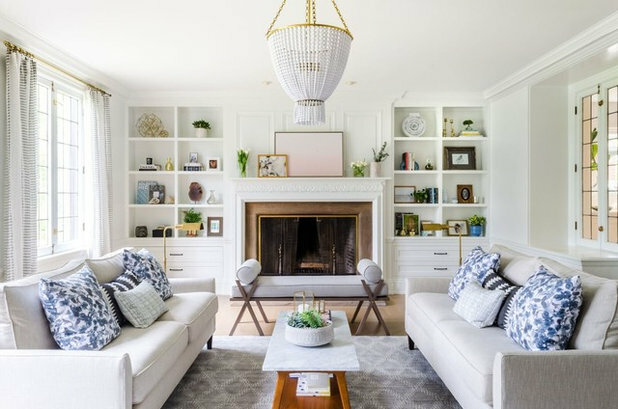 More than ever before, people are exposed to many different decor styles through the internet and blogs, and they want their own homes to have a little bit of everything. 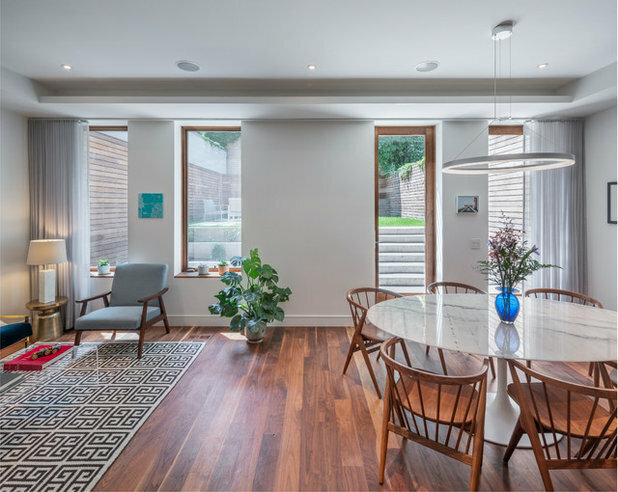 A traditional light can bring a great sense of richness and gravitas to a modern home, but the opposite combination can be just as beautiful. 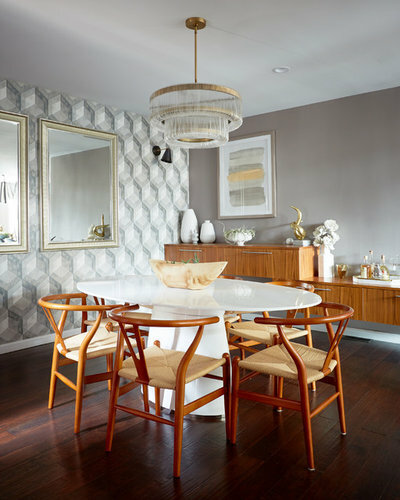 A contemporary or midcentury style of light combined with traditional furnishings gives the room a little bit of edge and brings it into the present in just the right way. 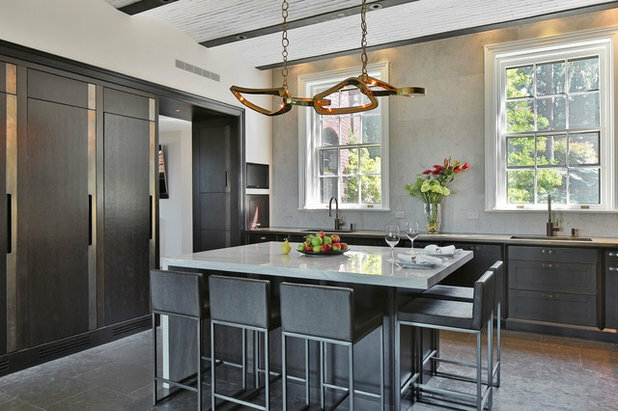 In re-reading this article and thread of comments, it occurs to me that it hasn't been mentioned that when you install ceiling lighting such as the basket-types or some of the other more textural fixtures, you will have shadows either on the ceiling or across the room. When we moved in here 6 years ago I was thrilled to find there were seven ceiling fans already installed throughout the house, and I agree with others here that they are wonderful, but this is the one thing I don't like about them -- the flickering shadows they create. 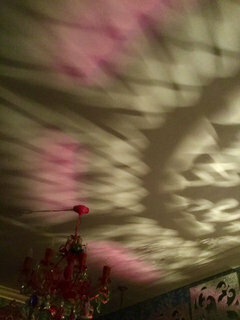 If the purpose of the chandelier is to provide light, why would you want a design that casts a lot of shadows? On the other hand, I find ceiling lights in general to be too glaring and bright. I have not been able to find LED bulbs, standard size, in a low enough wattage to bring our bedroom ceiling fan (4 round bulbs) to a comfortable brightness. Sometimes you want a light that bright but not all the time. 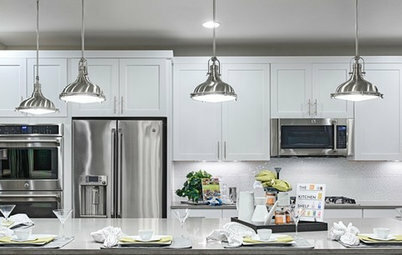 I'd love to find 15-watt bulbs to bring the 4 lights to the equivalent of one 60-watt bulb but the only ones I have found are decorative flame style that don't fit in the fixtures. If anyone knows where to buy such a thing, please let me know. hsneghan, I have two Moroccan lights in our bedroom that I had converted to chandeliers/hanging pendants, to go with the one I made. The patterns and colors they create on the ceiling are like a work of art all onto themselves. We love them. Kiriosities, that is really lovely and I see why you would love that. I guess it would make nice mood lighting in a bedroom.